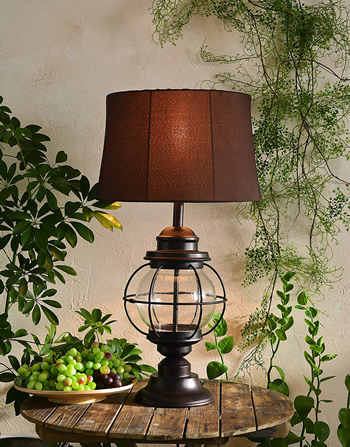 Standing at 28-inches tall, the Tanglewood outdoor table lamp will serve as a stylish addition to your outdoor living area. 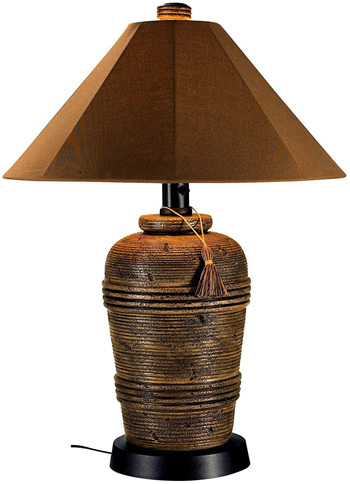 Coming in a bronze finish, the lamp features a simple support rod that leads up to the stunning shade. 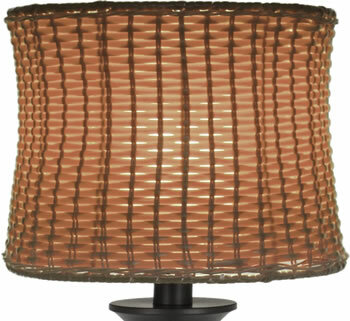 Natural looking all-weather rattan forms into a swirling pattern around a drum shade while the white glass inner shade peaks out from in between the swirls. The dual shade look adds a sense of depth and visual interest to the light, drawing the eye to the very top of the lamp. 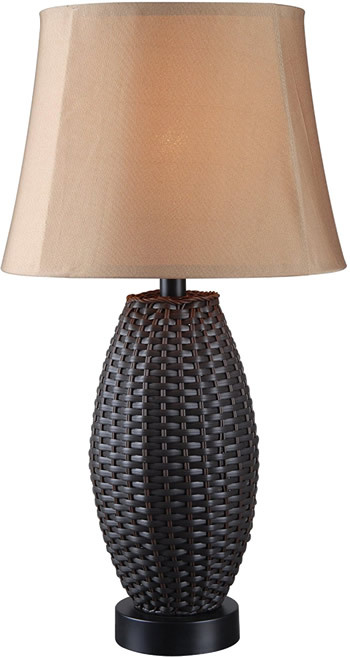 Perfect to be placed on a screened in porch with sleek furniture in neutral tones, this lamp will provide light for your weekend nights with friends over as you enjoy your freshly cooked bar-be-que on a side table! 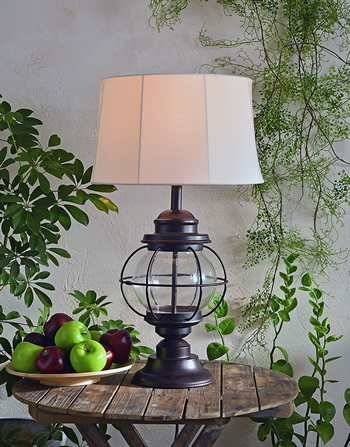 Whether your outdoor space is done in a farmhouse-chic style or a bohemian-infused design with rich colors spread around, the Tanglewood outdoor table lamp will bring style and function into your space. The Hatteras collection features a table and floor lamp combination that can withstand the weather, and the test of time. Inspired by vintage nautical decor, the seaside nuances are easily apparent in the crafted design and spherical lantern shaped frame of this family. Finished in a stunning gilded copper, the frames of these outdoor lamps harken back to the richly adorned fixtures found on antique commercial vessels. 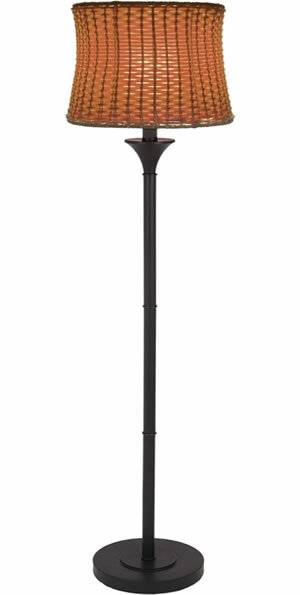 Standing at a towering 61 inches in height, the Hatteras floor lamp features a heavy weighted base and can easily withstand gentle sea breezes along with strong gusts on those rather blustery days. 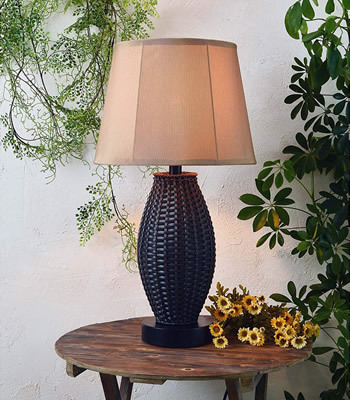 While large at 31-inches in height, you'll find the table lamp variation to fit in perfectly with a wide variety of outdoor furniture and side tables. 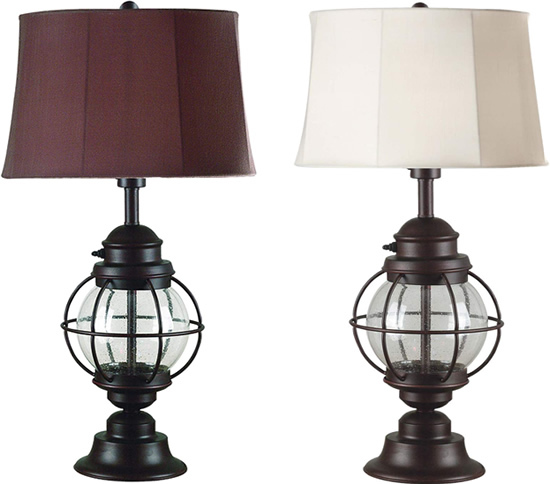 Each lamp in the Hatteras collection is fitted with two all-weather shade covers, a classic sea-sand white, and a rich chocolate option. 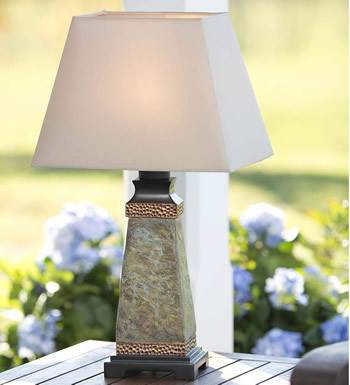 The Plow & Hearth Weatherproof Slate Outdoor Table Lamp has a gorgeous slate base highlighted with hammered faux copper accents. A versatile solution for patio, porch, deck or sunroom, this indoor/outdoor lamp has a completely weatherproof shade, light bulb enclosure, cord and plug; 60W bulb not included. 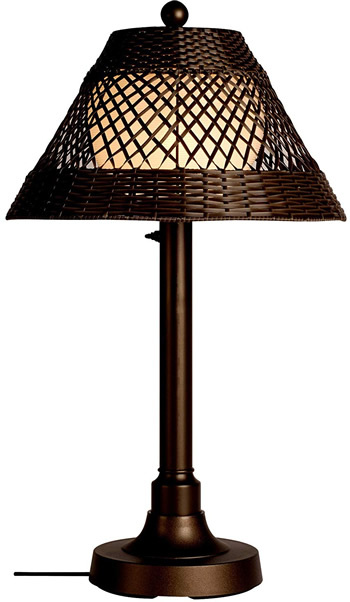 Light up your outdoor living areas with our completely waterproof outdoor wicker lamp that standsup to the elements. 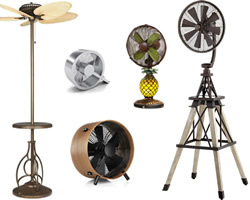 Place it on a porch, deck, patio or gazebo & enjoy easy outdoor lighting without worry. The outdoor-grade plug, cord & elements make it safe to use anywhere, while the resin wicker shade & bamboo-inspired column lend a decorative touch. The substantial base is weighted for stability. 10' cord makes it easy to place anywhere. 60W bulb included. 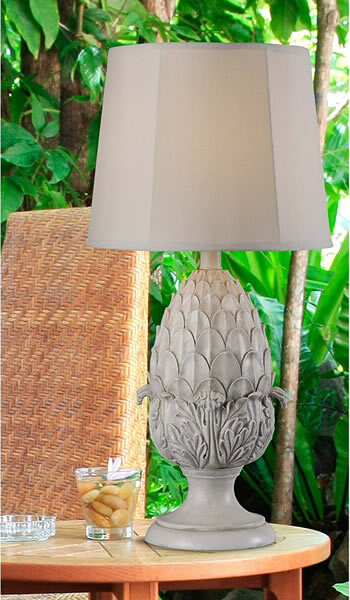 Farm House or Beach House, the Harbour Outdoor Table Lamp is the ideal look at the ideal price. Add lighting exactly where you want it in your covered porch or outdoor living area. 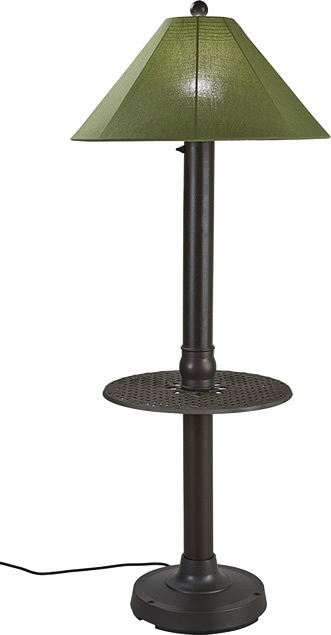 Available only in Blackened Oil Rubbed Bronze finish. 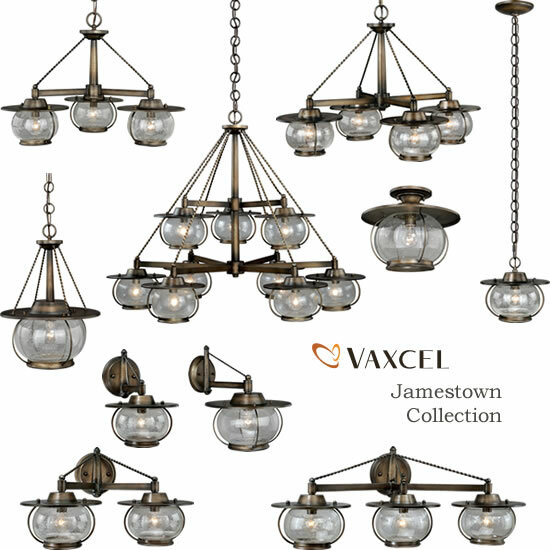 Coordinating pendants are available in Brushed Steel, Copper or Blackened Oil Rubbed Bronze finish with a Reflective White interior. 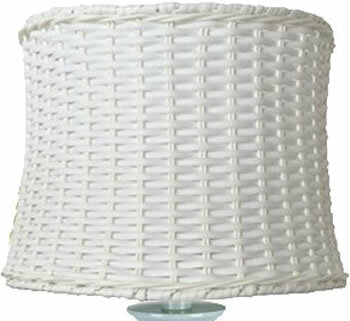 Width 22.5" x 21" x Height	30"
All weather hand woven PVC wicker shades highlight these elegant weatherproof lamps. All resin construction with heavy weighted bases and two level dimming switch ensure these lamps will enhance any outdoor living are. Unbreakable opal polycarbonate light bulb enclosure allows use of standard light bulb. 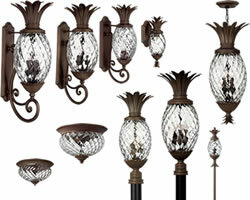 Width 18" x Height	32"
Add casual elegant styling and light to your outdoor living area. Phoenix lamps feature all resin construction with a heavy weighted antiqued copper and brushed pewter base with carbon black accents with black canvas Sunbrella shade cover. 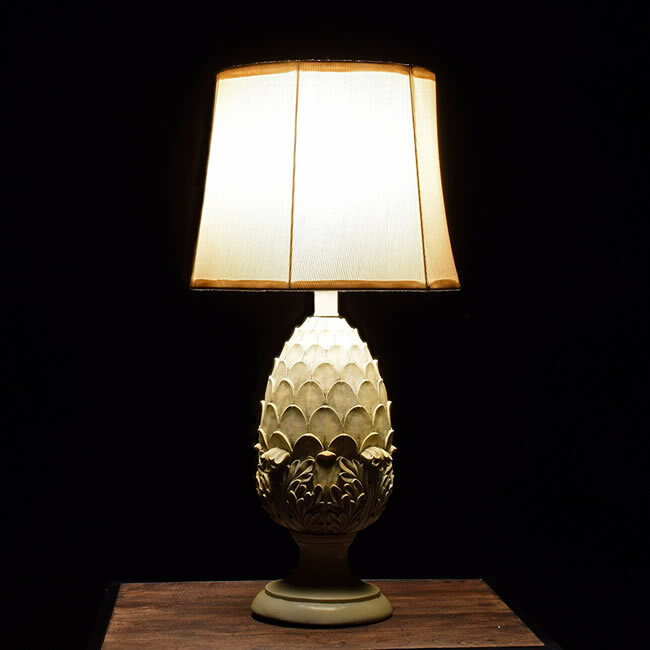 Lamps are completely weatherproof and have a two level dimming switch and weatherproof cord and plug, 12 ft. on the floor lamps, 16 ft. on the table lamps. Unbreakable poly-carbonate waterproof light bulb enclosure allows the use of a standard light bulb. Width 14" x Height	34.5"
Carefree durability while adding a touch of casual elegance to any outdoor living area. 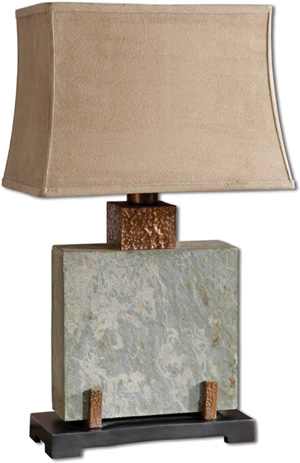 Lamps feature all resin construction with a heavy weighted antique suede base and bronze accents with a Cocoa Sunbrella shade cover. 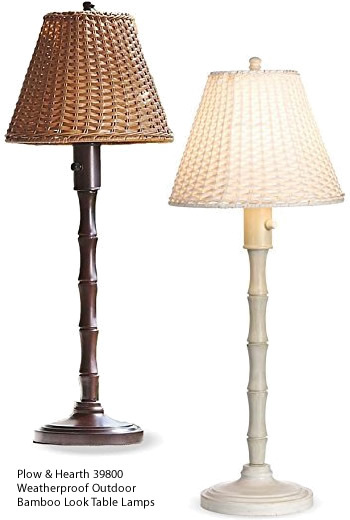 Lamps are completely weatherproof and have a two level dimming switch and weatherproof cord & plug, 12 ft. on floor lamps, 16 ft. on table lamps. Unbreakable poly carbonate water proof light bulb enclosure allows use of standard light bulb. 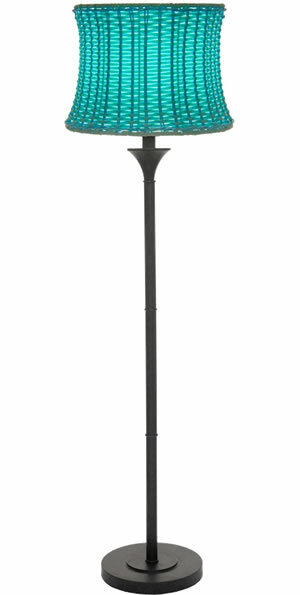 Perfect for patios or porches, this lamp has been outdoor tested to withstand the elements, but can also be used indoors. 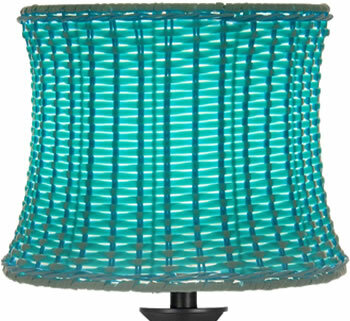 The vibrantly colored basket-weave shade and bamboo shoot style base will fit perfectly with any decor style. 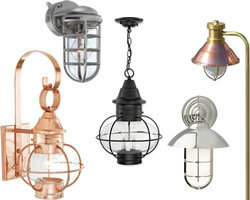 chandeliers and pendants rated outdoor damp or wet location. 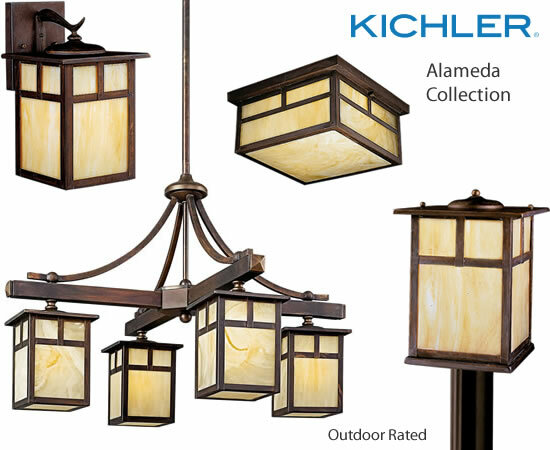 Dimensions: Tall: 14.5" x Wide: 25"
Dimensions: Width	25" x Height	17"
This 4 light indoor or outdoor chandelier from the Alameda™ collection will bring a cozy, down-to-earth design to your outer décor. 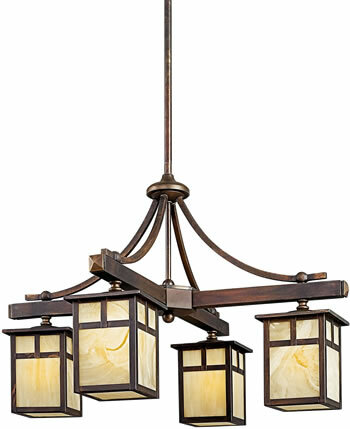 A classic lantern shape, this fixture features a distinctive Canyon View™ finish and luminous Honey Opalescent Glass. Carefree durability while adding a touch of elegance to any outdoor living area. Lamps feature resin construction with a 3" tubular body and heavy weighted bases. 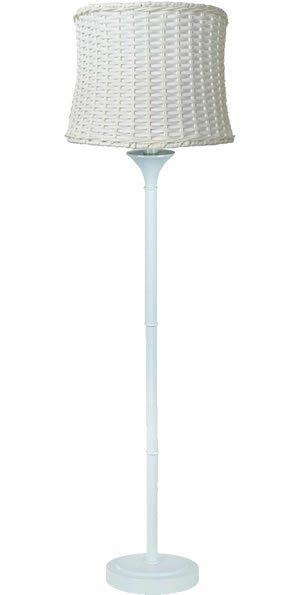 Lamp is completely weatherproof and has a two level dimming switch and 12 foot weatherproof cord & plug. Acrylic waterproof light bulb enclosure allows the use of a standard 100 watt light bulb or comparable LED or CFL. Shade: Lamp shade is 6 1/2" x 11 1/2" x 25"
Other shade colors available by special order. 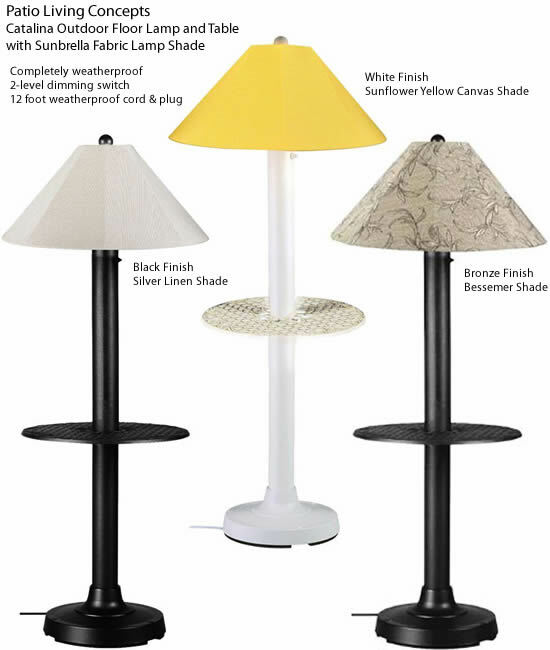 Lamp shade and base are completely weatherproof. 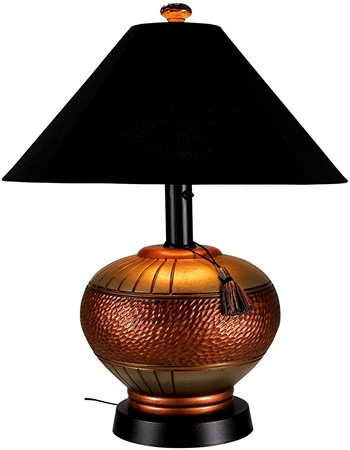 This indoor/outdoor lamp is made of real hand carved slate with hammered copper details. Due to the natural material being used each piece will vary. The rectangle bell shade has a brushed sueded, weather resistant textile. 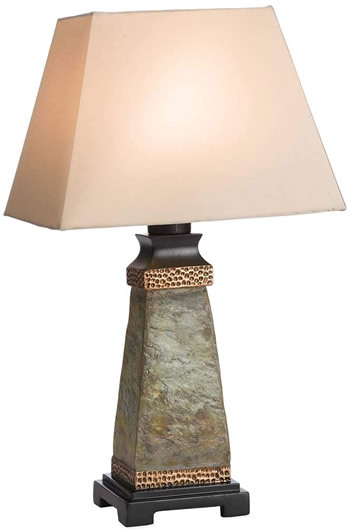 Finish: The base is made of real Hand Carved Slate with Hammered Copper Details. Due To the Natural Material Being Used Each Piece will Vary. For Indoor/Outdoor use. 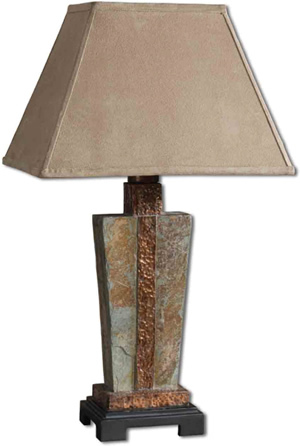 This indoor/outdoor lamp is madereal hand carved slate with hammered copper details. Due to the natural material being used each piece will vary. The rectangle bell shade has a brushed suede, weather resistant textile. 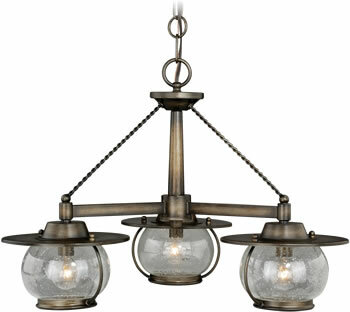 Dimensions: Tall: 18" x Wide: 21"
This outdoor chandelier features an industrial inspired canopy with coastal styling. 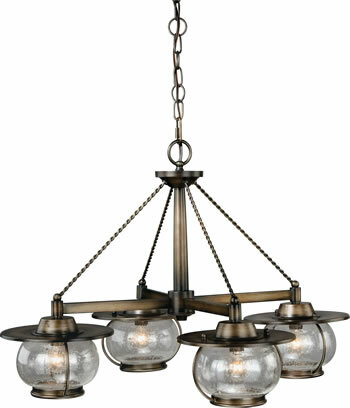 With a rich oil rubbed bronze finish and matching chain, this design inspired outdoor chandelier offers peaceful overhead lighting to a screened-in patio or deck. 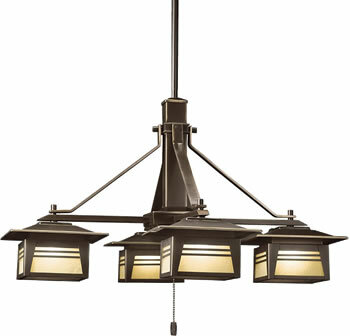 Dimensions: Tall: 17" x Wide: 10"
This outdoor pendant features an industrial inspired canopy with coastal styling. 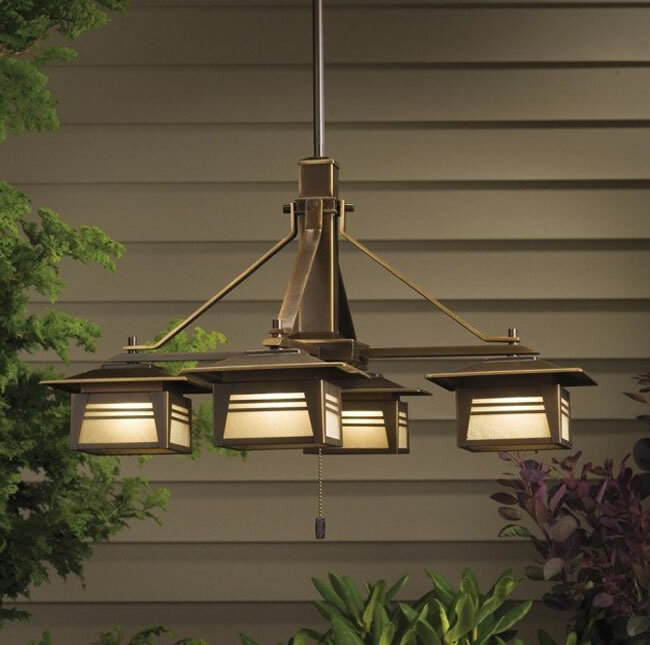 With a rich oil rubbed bronze finish and matching chain, this design inspired outdoor collection offers peaceful overhead lighting to a screened-in patio or deck. 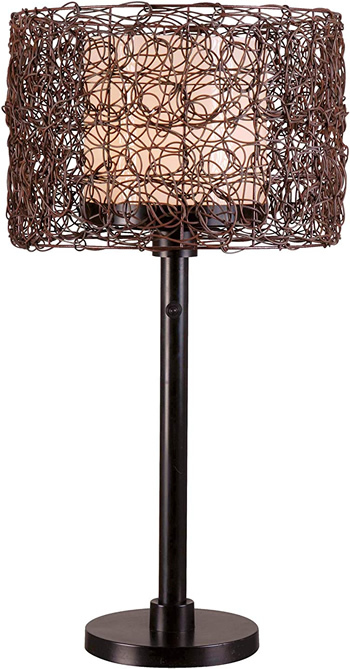 This indoor/outdoor lamp is madereal hand carved slate with hammered copper details. The rectangle bell shade is a brushed suede, weather resistant textile. Due to the natural material being used each piece will vary. 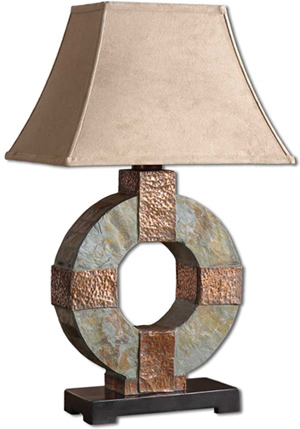 This indoor/outdoor lamp is madereal hand carved slate with hammered copper details. The rectangle bell shade is a brushed sueded, weather resistant textile. Due to the natural material being used each piece will vary. Finish: Hand Carved Slate with Hammered Copper accents, Tuscan Crackled metal details and a Black Foot. For Indoor/Outdoor use. 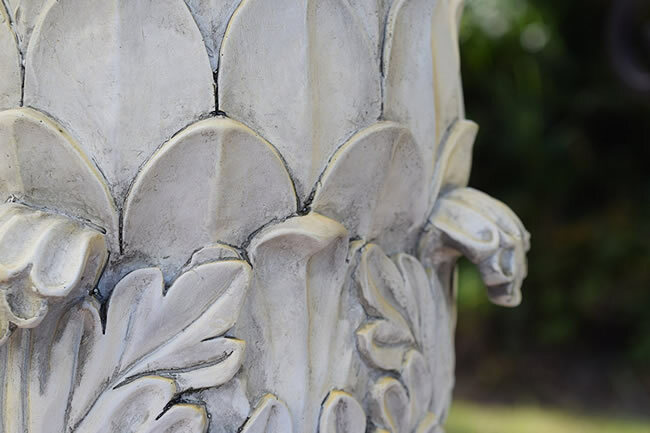 This decorative finial is suitable for indoor or outdoor use. The finish is antiqued, aged ivory with burnishing details. Finish: Antiqued, aged Ivory with Burnishing. Indoor/Outdoor Finish.